Although our stay at Xugana Island Lodge had been an amazing experience, one we both would not have wanted to miss, we did appreciate now being able to sleep in a warm room, and to lie in till 7.00! 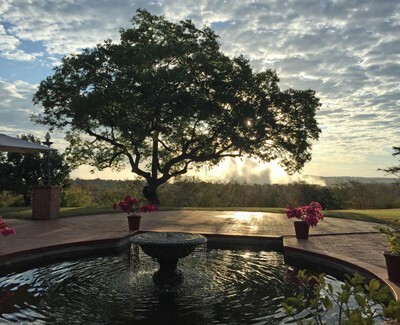 And we woke to a beautiful day and a view from our window of the sun shining through the spray of the falls. 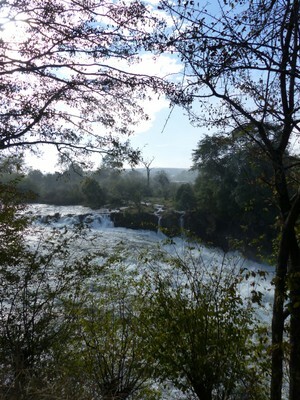 We had breakfast in the Jungle Junction (a decent buffet selection) with more great views of the spray. Then we went to the front entrance to meet our guide for a visit to the falls, Patrick. 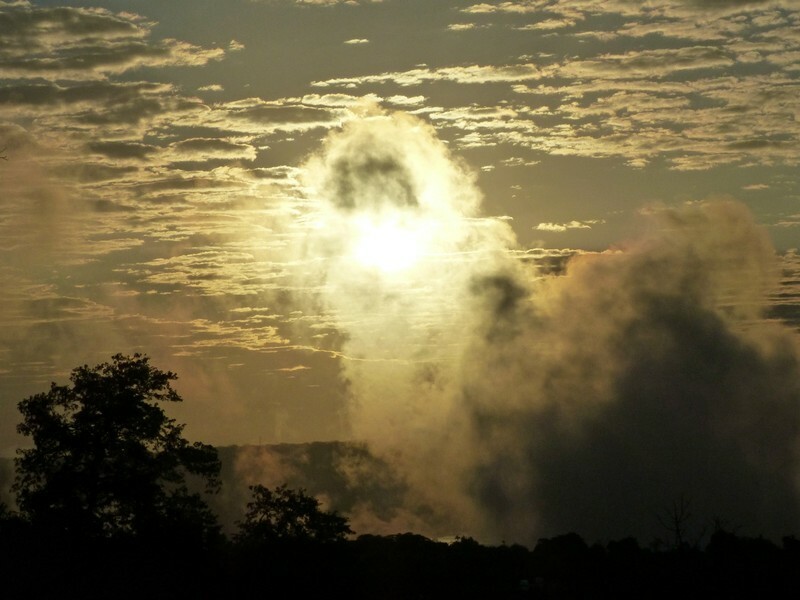 The indigenous name for Victoria Falls is Mosi-oa-Tunya or The Smoke that Thunders, and it is a fitting name. The constant spray is as thick as smoke, and the roar of the water is indeed like thunder. The amount of spray and water varies with the season, with May being the month when it is at its highest. 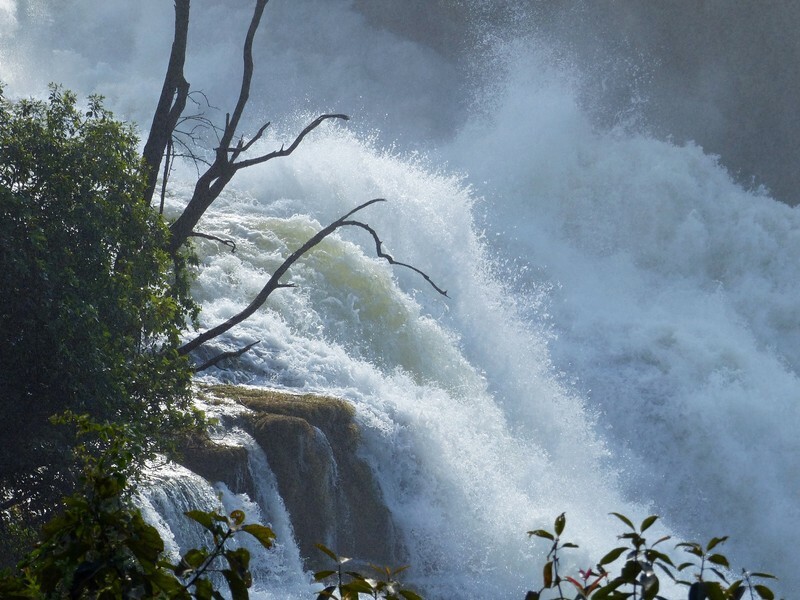 July should be a good month to visit, with the water volume dropping just enough to make the falls more visible through the spray, but this year, Patrick told us, they have had more water than for 20 years and so the spray was still very thick. 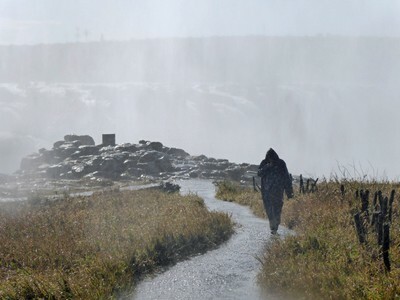 At any time of year though, you will get wet here, despite the heavy raincoats that are issued to all visitors who want them. There is a path that follows the edge of the escarpment overlooking the falls, with a series of numbered viewpoints, 1-16. 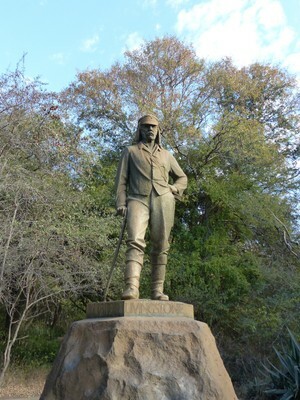 We started, naturally, at point 1, where we saw the statue of David Livingstone. 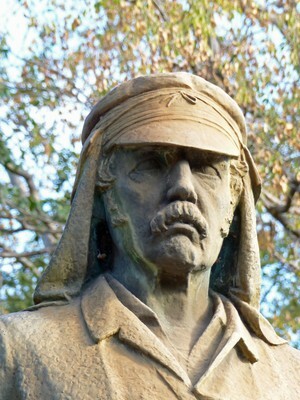 He was a Scottish missionary and explorer, who is believed to have been the first European to see the Falls, on 16 November 1855, from what is now known as Livingstone Island, which divides the waters roughly in their mid-point. 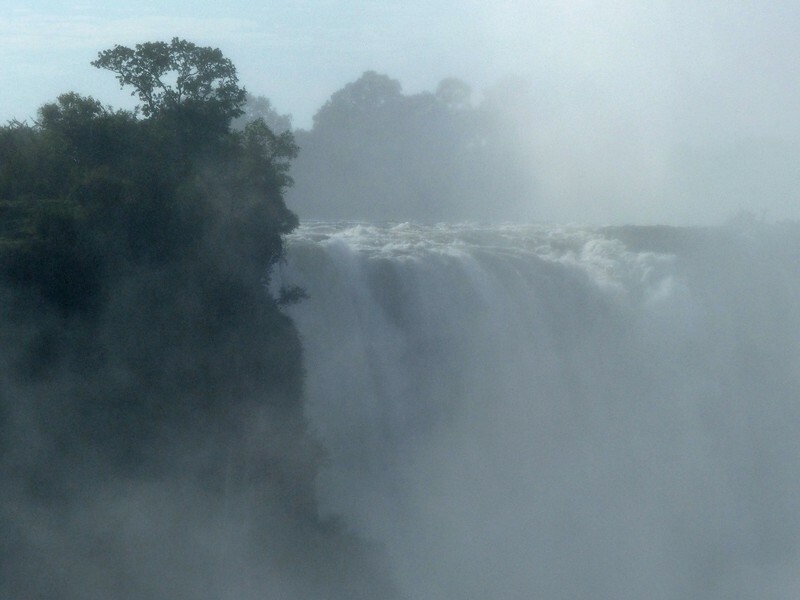 It is wrong however to say, as some do, that Livingstone ‘discovered’ the falls, as of course they were known to local people for centuries before his visit. What he did do was to publicise their existence to the outside world and he can therefore be seen as the father of tourism in this area. I enjoyed ‘meeting’ Livingstone here as way way back when I was at junior school (aged between 7 and 11, for non-UK readers) all pupils were divided into four houses for sports events etc., all named after explorers (I guess to inspire us) and mine was Livingstone. The next few viewpoints on the path, numbers 2 to 7, are of what is known as the Devil’s Cataract, and are relatively clear of spray. Consequently, I found this ‘offshoot’ much easier to photograph than the main torrents. 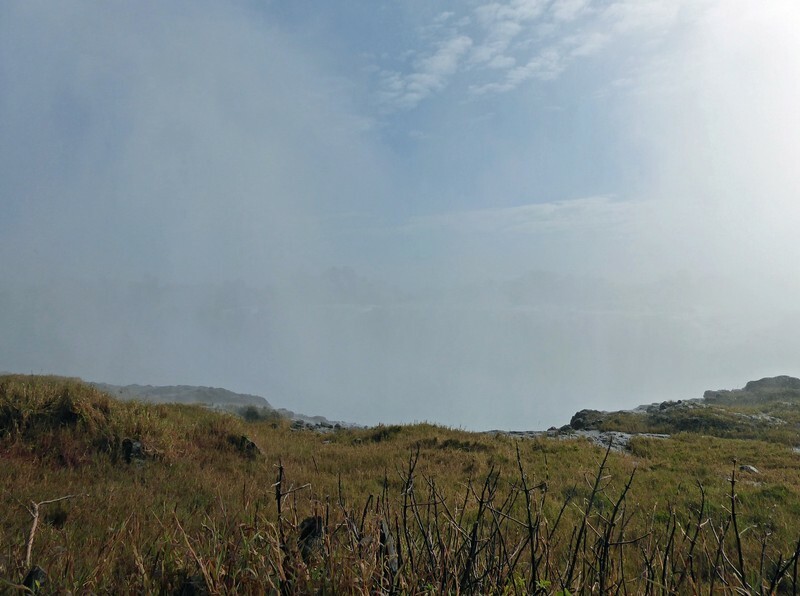 The Devil’s Cataract is separated from the rest of the falls by Cataract Island, one of two islands that remains visible and above the water level even at its highest. At viewpoint 3 we descended the stone steps (some of them rather steep and all slippery, so I was glad of the wooden handrail) to see the Devil’s Cataract from a lower angle. 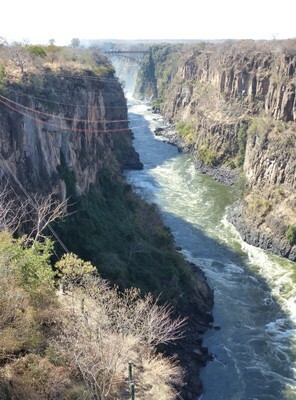 Here you can look directly along the gorge and see the waters of the cataract shooting down into it. Even with all the spray we got a fantastic sense of the power of this section of the falls – and this is where they are at their lowest point! At the next few viewpoints I got some more shots of the Devil’s Cataract, some of them quite clear, and some glimpses of the Main Falls beyond. 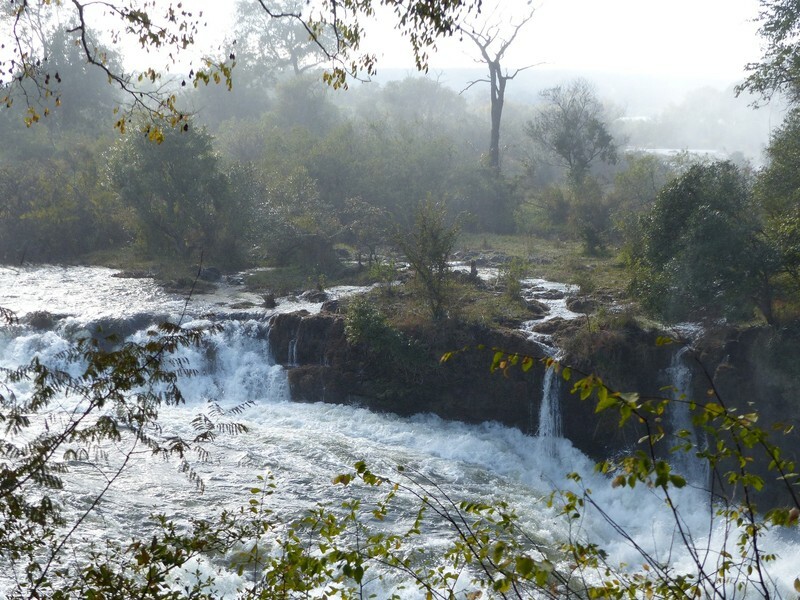 At viewpoint 7 we started to see the full extent of the Main Falls, or at least in part, as they disappeared into the mist. 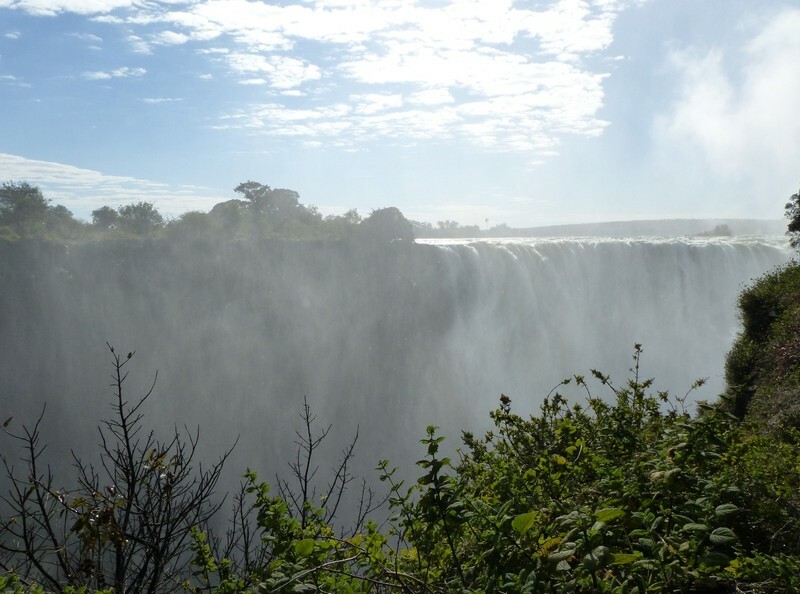 The other island that remains visible year-round is Livingstone Island, which separates what are known as the Main Falls from the sections that lie further east – Horseshoe Falls, Rainbow Falls (the highest) and the Eastern Cataract. All of the latter flow as one when the river is in full flood, as it was now, but in the dry season they are separated by other, smaller islets, and at its driest the Eastern Cataract dries out completely and it is even possible to walk out on this ridge. No chance of that today!! 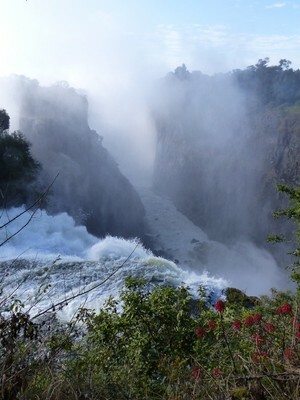 The border between Zimbabwe and Zambia runs through Livingstone Island and then turns along the length of the falls to twist into the series of gorges the Zambezi has carved downstream from them. 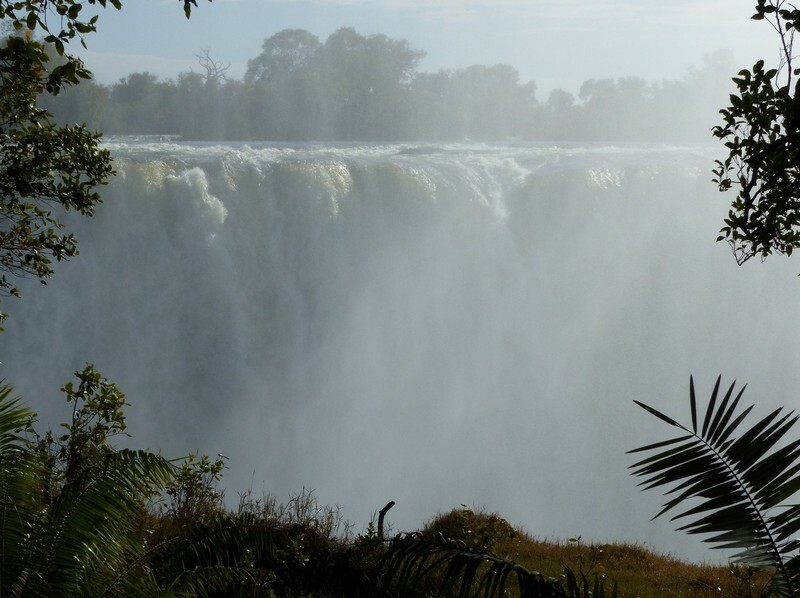 This means that about 70% of the falls can be viewed from the Zimbabwe side and 30% from Zambia. How big are the falls? I hope my video will give some little sense of the size and power of these falls. There are several ways we can measure the size of a waterfall – its height, its width, the volume of water. 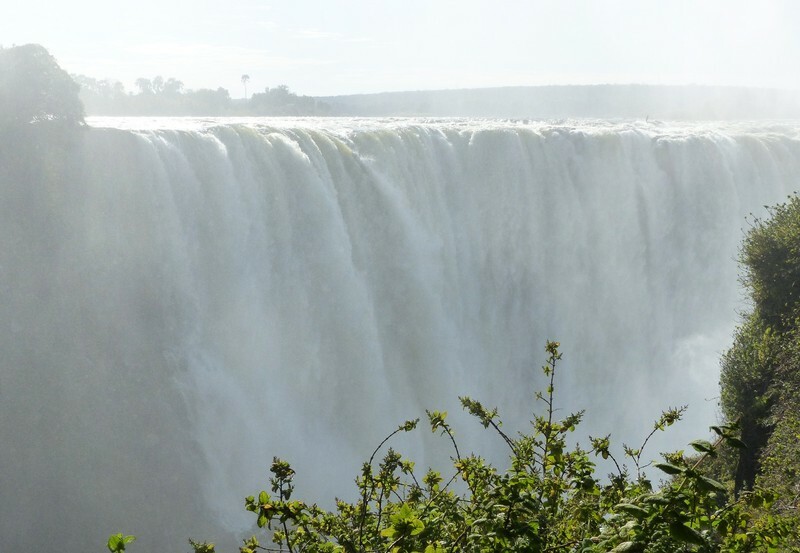 On the first two measures Victoria Falls is not the largest in the world; it is neither the highest nor the widest. The prize for highest goes to Angel Falls in Venezuela – 979 metres compared with Victoria Falls’ mere 108 metres! Niagara Falls, by the way, are just 51 metres at their highest and Iguazu 82 metres. 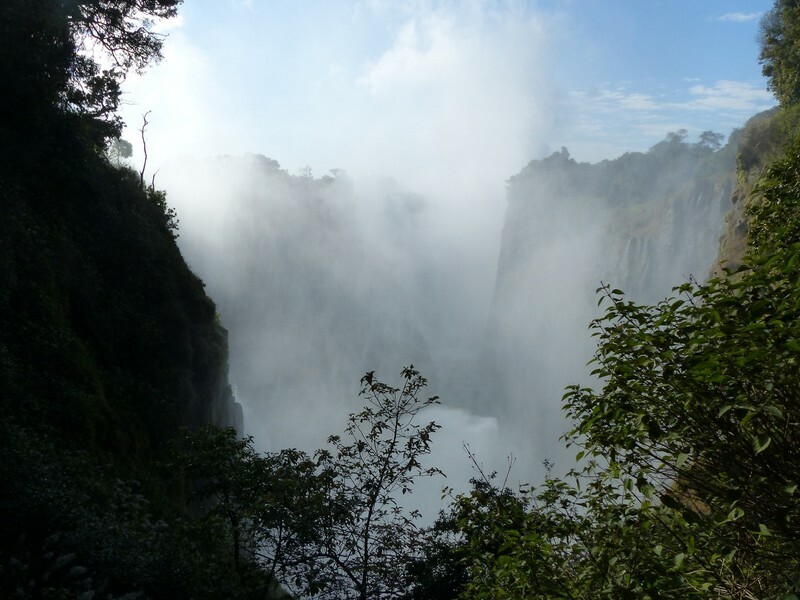 The latter wins the prize for width, at 2,700 metres, whereas Victoria Falls are just 1,708 metres. These falls don’t even have the largest volume of flow. So why are they often cited as the largest waterfall in the world? It comes down to the combination of width and height, creating the world's largest sheet of falling water. But comparisons matter little once you are here, and confronted by this thundering deluge. From viewpoint 8 onwards we were facing the main section of the waterfall, and with the falls still in full flow there was so much spray we had to peer through it to see the falls themselves. From this point on I had to abandon using my main camera. Now we really needed our raincoats, and cameras, bags etc all had to be buried beneath them. But I kept my compact camera up my sleeve and pulled it out for a few hurried shots, the lens dotted with drops almost the instant I opened it. It was just possible to make out the alteration in the landscape here – near viewpoint 12 the rainforest gives way to grassland dotted with small shrubs and occasional palm trees. Peering carefully you may just make out the falls beyond! Walking here in these conditions you would think yourself in a heavy rainstorm! But unlike rain, the spray swirls around you in all directions, even upwards. Despite the raincoats the water seeped in here and there, and of course our shoes and the lower part of our trousers were sodden! 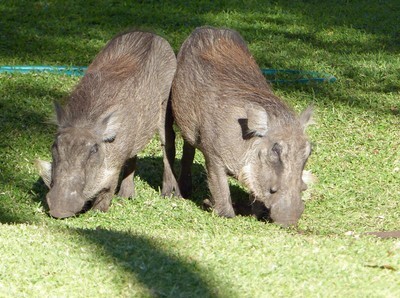 It would be a good idea to wear sandals here, but we had not brought any, having had to pack so lightly for Botswana. Still, nothing stays wet forever, even spray-drenched trainers! 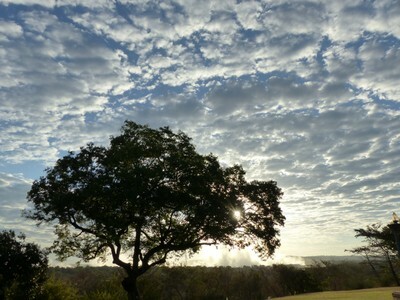 But this shot, taken immediately after the one above, shows how quickly the spray made photography almost impossible! It was near here that I started to see rainbows in the spray – not over the falls but looking in the other direction, away from them towards the shrubs around the path. Viewpoint 15 is known as the Danger Point, as here there are only slippery rocks between the path and the sheer drop into the churning waters below the falls. 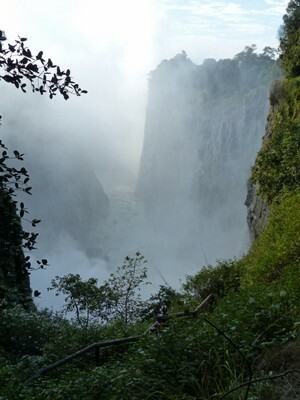 In the dry season it is possible, with care, to scramble out over the rocks for an excellent view of the exposed rock face that at other times of year forms the Eastern Cataract. In the wet season such a scramble is at best inadvisable and at worst impossible. I was so soaked by now that I saw no reason to get even more so on this exposed promontory, especially as I would have no chance of any photos there, but Chris decided that having come all this way he was going to see everything possible, so he took the path around the point although of course stayed off the rocks. You can imagine how pleased I was to see him re-emerge through the mist! 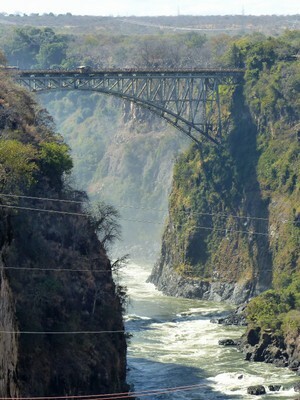 At the final viewpoint, 16, you can see the bridge that links Zimbabwe with Zambia. This bridge was built at the start of the twentieth century, opening in 1905, to carry the railway line between what was then Northern to Southern Rhodesia. 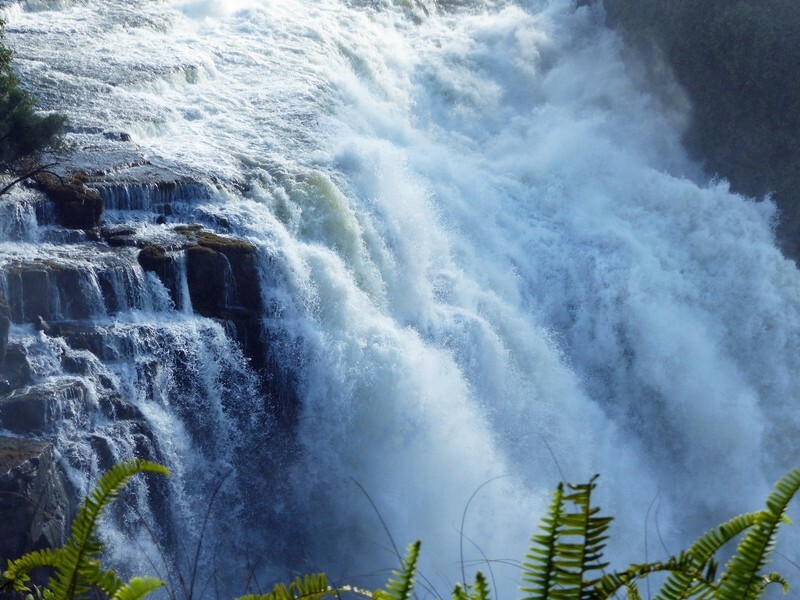 There was a lot of opposition, understandably, to building it here – many saw it as an act of vandalism, destroying the natural beauty of the falls, and campaigned for it to be located further upstream. 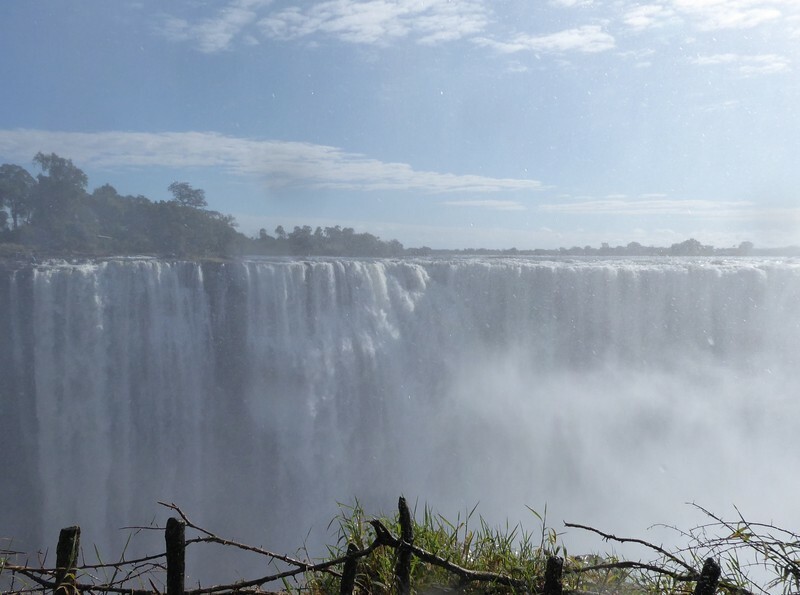 But Cecil Rhodes, whose brainchild it was (part of his vision for a railway linking Cairo to the Cape), insisted that train passengers should be able to feel the spray of the falls as they crossed – even though he himself never visited Victoria Falls! On its completion his brother Frank, one of its fiercest opponents, said that all that remained to be done ‘was to pray for an earthquake’. Since then though it has become an integral part of the landscape and forms a vital link between the two countries. 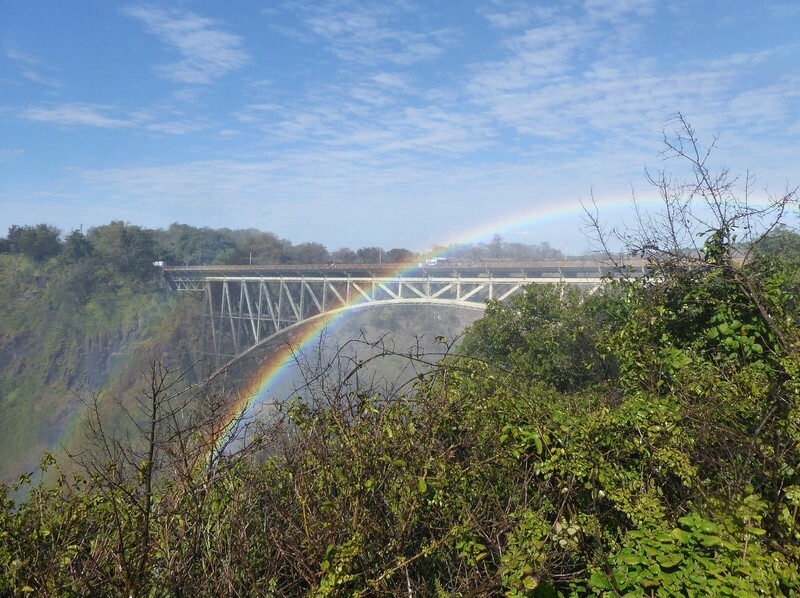 It was a main driver of tourism in the early part of the twentieth century and the Victoria Falls Hotel, where we were staying, was opened at around the same time as the bridge to accommodate travellers arriving on the new railway. 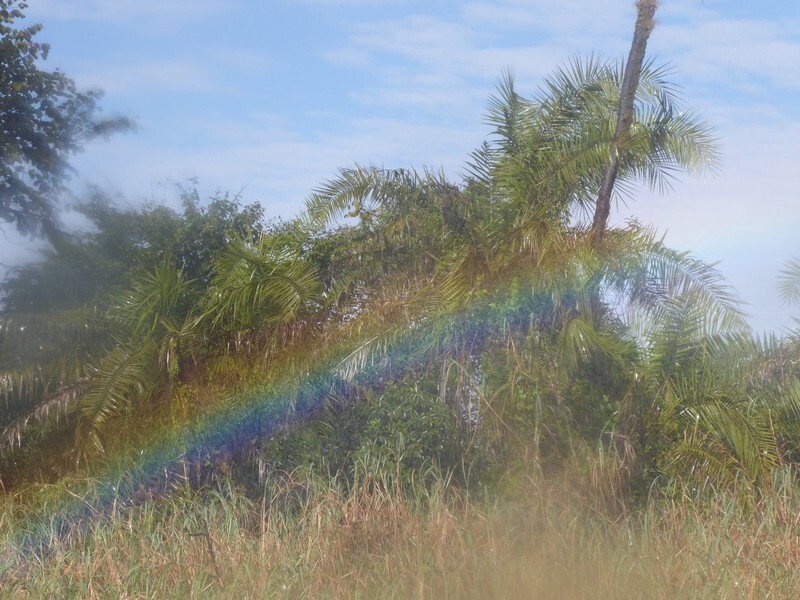 At this viewpoint there was less spray on the path, but what there was created a beautiful rainbow between path and bridge. From here we walked back to the main entrance through part of the rainforest that surrounds the falls. 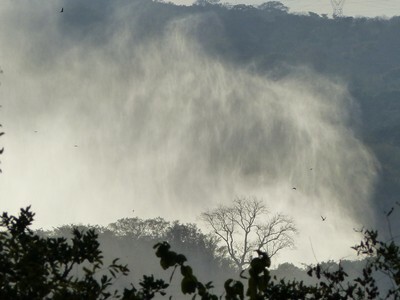 The volume of spray here has created this mini-ecosystem, a rainforest in the savannah. 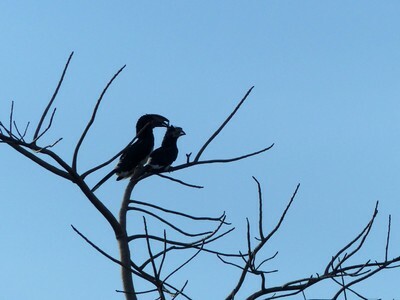 You will find palm trees, ebony, mahogany and other rainforest plants, just a few metres from the much less lush surroundings. 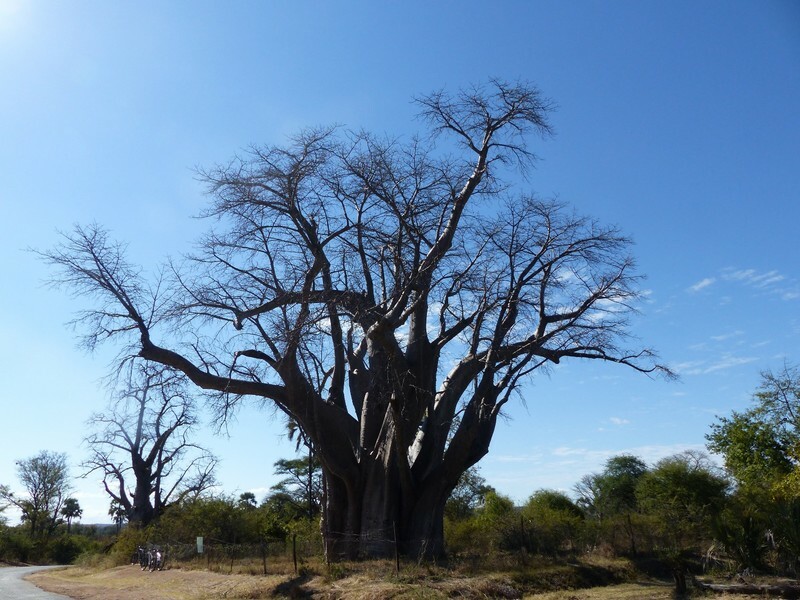 Patrick had told us as we walked about the so-called Big Tree, an ancient baobab that he said was the oldest in southern Africa. He offered to take us to see it, as a small addition to our tour, and we accepted, so he drove us the short distance from the falls to where it stands by the side of the road. A sign says that its girth is 18 metres and its height 23. It is between 1,000 and 1,500 years old. Back at the car park we said goodbye to Patrick as we had decided to walk back to the hotel via the Lookout Café, which we had passed and liked the look of yesterday. This time we stopped here for a drink, with a view of the gorge and some people zip-lining. We walked back to the hotel, our feet still decidedly damp, to dry out, catch up on emails and eat lunch again on the Stanley Terrace. Afterwards we walked into town, or at least the part nearest the hotel, where we found plenty to occupy our afternoon. Can you see his head among the leaves? 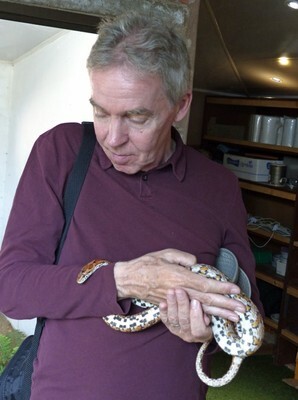 I had seen some positive reviews of the Victoria Falls Snake Farm and as I have an odd liking for these reptiles we decided to visit - and were very glad we had. 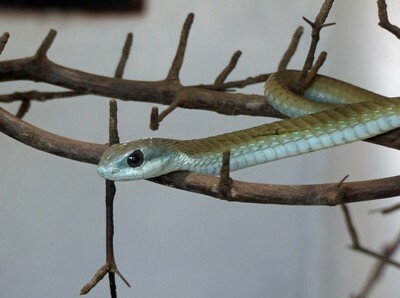 This small collection of snakes, mostly from Zimbabwe or neighbouring countries, is not a zoo in the conventional sense, as the animals spend just a short time here while recuperating from an injury. Or, in the case of the handful of non-local snakes which have been confiscated during attempts to smuggle them in, while they can be found a suitable home. We paid the $6 entrance fee and were asked if we’d like a guide. 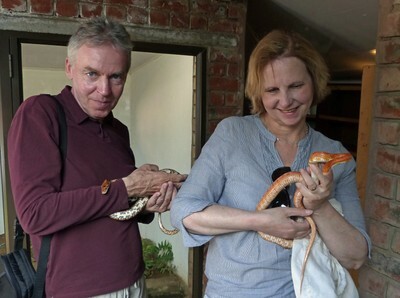 Chris thought no, we could look round on our own, but I had read that you can sometimes handle one of the snakes and I thought that more likely if we were accompanied on our tour. So we accepted the offer and the guy shut up the box office (we were the only people there at that point), introduced himself as Abraham, and proceeded to take us from one snake to another, telling us various details as we went - habitat, rarity, whether venomous or not, and, if venomous, how long you could survive a bite without anti venom! 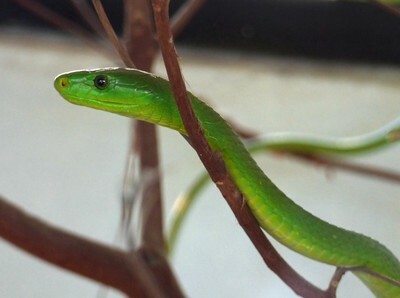 The Green Mamba, we learned, is less venomous than its black cousin, while the Common Boomslang is very venemous but rarely bites humans, thankfully. 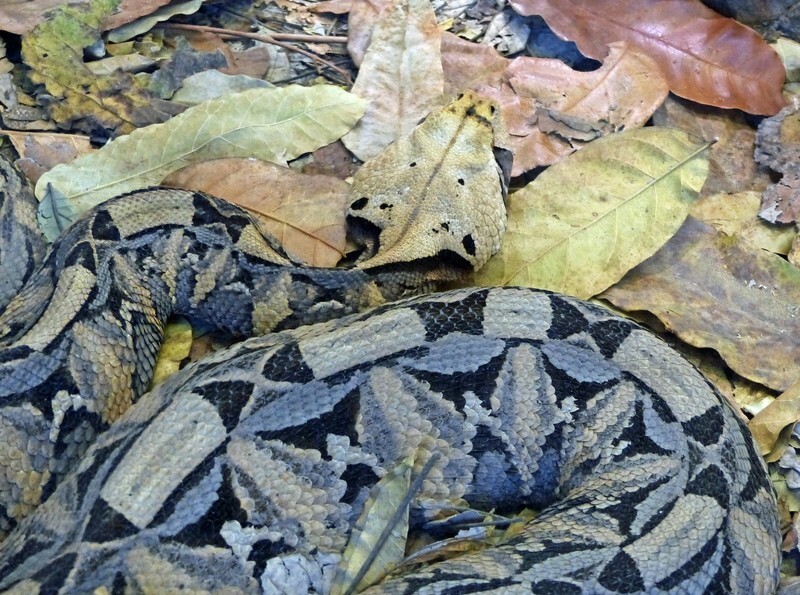 The bite of the Gaboon Viper will prove fatal without prompt hospital treatment, as it attacks internal tissue. 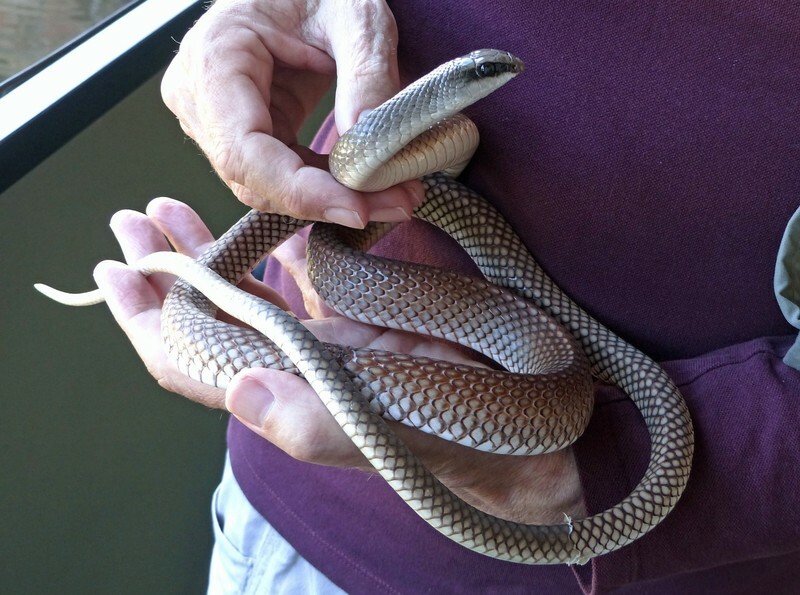 When we came to the first of his non-venomous snakes, a Rufous Beaked snake, he asked if we’d like to hold it. Of course we would! So first Chris, and then I, were allowed to hold this rather beautiful little creature. 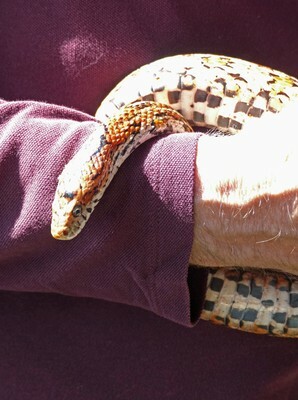 He felt very gentle on my skin as he moved slowly across my hand, and posed nicely for Chris’s camera. We continued our tour to where in one corner there were some small tanks with scorpions and spiders - I didn’t ask to hold them! Then Abraham reached his hand into the hidden corner of one and emerged with a vivid green chameleon gripping his fingers. Would we like to hold him? You bet! By this time others had arrived and were waiting at the ticket office, so he left us briefly to admit them, then continued the tour. This was a family from Windhoek in Namibia who were as fascinated we were, so they joined us in listening to Abraham’s wealth of information. I always enjoy meeting people who have a passion for something and know how to share it, as Abraham does. 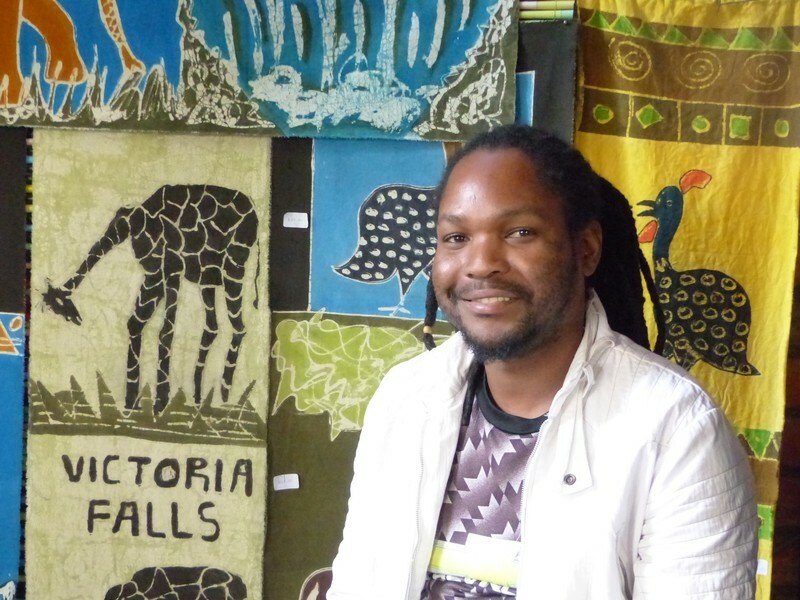 He told us he had studied snakes at university in Harare and come here to work two years ago. 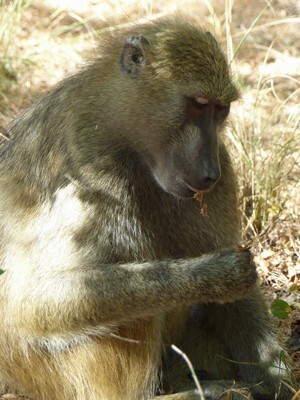 At home he breeds rats, to feed the snakes, and also searches for frogs and lizards, the preferred diet of some. He clearly cares for these creatures and wants them to thrive. After a few more native snakes we came to a pair of Corn Snakes from the US, among those that had been confiscated at the border. We were allowed to hold these too. The one Chris took, Mikey, was rather sleepy and rested in his arms, but mine, Frank, was really fidgety and I was concerned he would fall. But no, he just wrapped his tail around my arm and continued to explore. I could feel the muscles rippling along his slender body - wonderful! More visitors arrived and Abraham went to let them in, leaving us holding our new friends. When he returned we passed them to the Namibian visitors, looked at the last couple of snakes, and took our leave, thanking Abraham for the excellent tour. 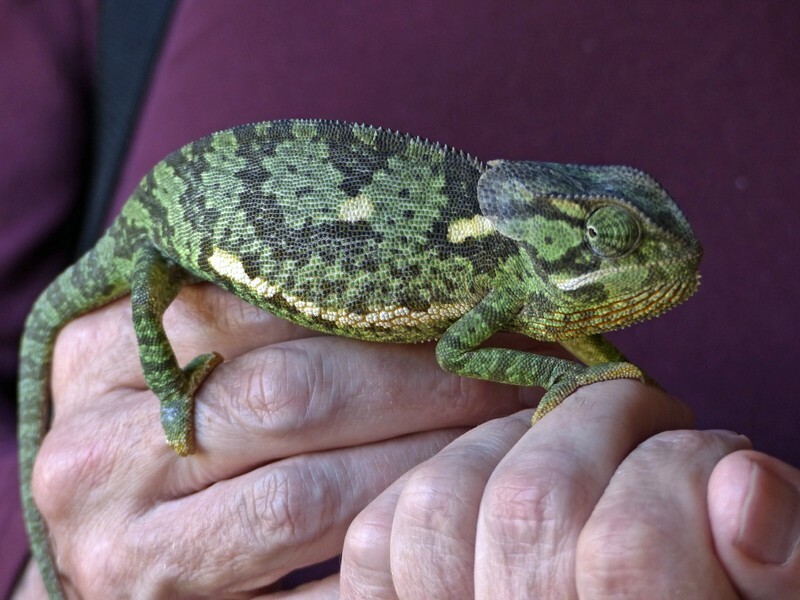 We didn’t come to Victoria Falls for wildlife experiences, and certainly didn’t expect to be holding snakes and chameleons, so this was a great bonus! Just down the road from the snake farm we came to this group of craft shops, which also has a small museum and a café. 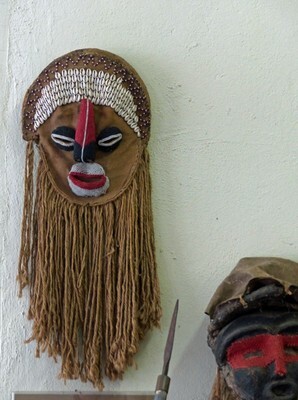 We checked out the excellent animal photos in a small gallery and visited the museum which had some interesting displays about Zimbabwean history and culture, and about the development of the falls as a tourist attraction. 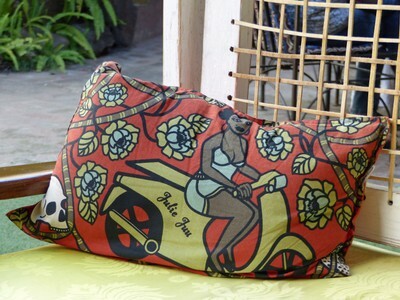 We had a cold drink in the café in the central courtyard - a lovely place to relax. The owner came past and stopped to chat briefly about other attractions in the area. 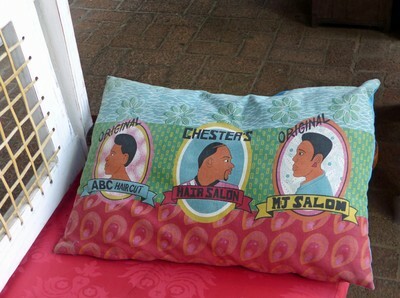 We went into a few more shops (I bought a pretty silver bangle) and took some photos. It was nice to shop in such a laid-back place, as on the streets and on the paths near the falls you are continually harassed to buy by street vendors. 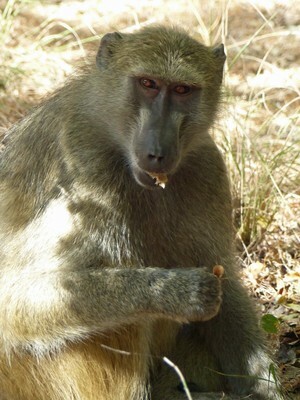 Then we walked back to the hotel, passing baboons and warthogs on the way, to try to finish drying our shoes, still wet from our morning at the falls. We started the evening with drinks on Stanley’s Terrace, then had dinner again in the Jungle Junction (we would have preferred to eat at Stanley's but that seemed a waste of money when our half-board deal meant we would have to pay twice for dinner) and later watched the World Cup (France v Belgium) on TV in our room. It had been another super day! Spectacular waterfalls. My childhood next door neighbor had a pet chameleon. I liked it a lot better than his previous pet skunk. It was supposedly descented but it still didn't smell very good. The chameleon was a clean, peaceful little guy. Sounds like a very fun experience. How I envy you that chameleon. My daughter has a snake so am used to handling him whilst she cleans out his tank (though he does protest and tries hard to get back to her) but holding a chameleon is something else!! So many bonuses on this trip. Yes Yvonne, the chameleon (and the snakes) were an unexpected bonus. I loved him! Ah yes I can see there's a lot more water. 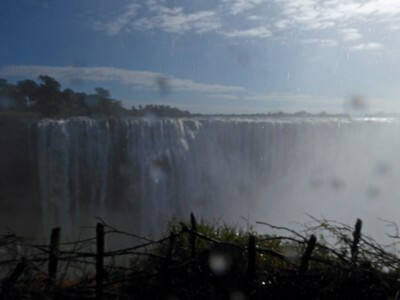 Your views of the spray from Victoria Falls Hotel are amazing. We also saw spray but much less and distant. Point 13 was where the most spray was when we visited. It was the only place we could not see the falls clearly. The water made a lot of noise when we were there. Yours must have been deafening. Very impressive.